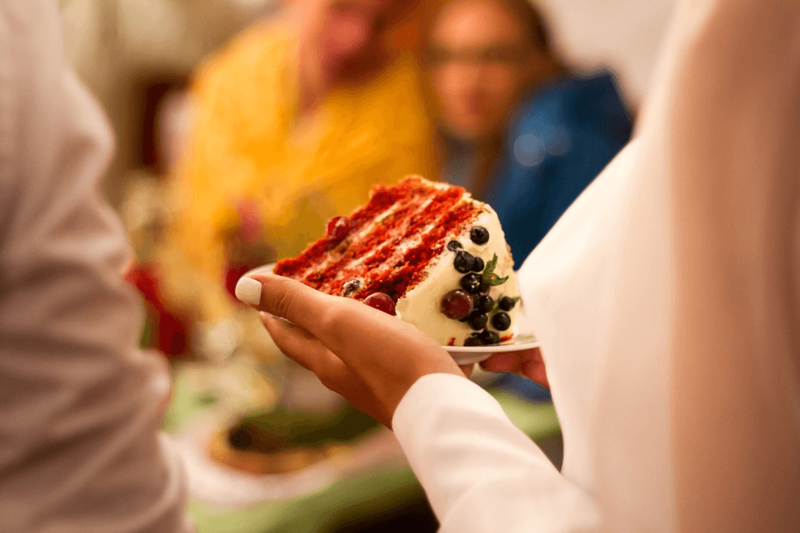 The cutting of the cake is one of the highlights of a wedding, so you’re going to want to choose a cake that blows your guests away. 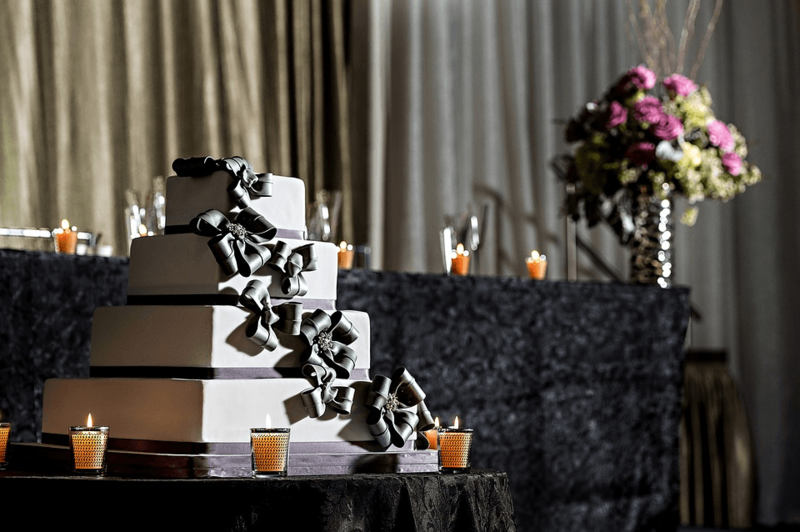 Weddings have changed over time, but something that’s still a big feature of any reception is the wedding cake. It’s something that you can share with all your guests, provides a perfect photo opportunity and is a great way of adding a little extra personality to proceedings. With all of that to think about, picking a cake can be a little tricky. Luckily, we’re here to help! 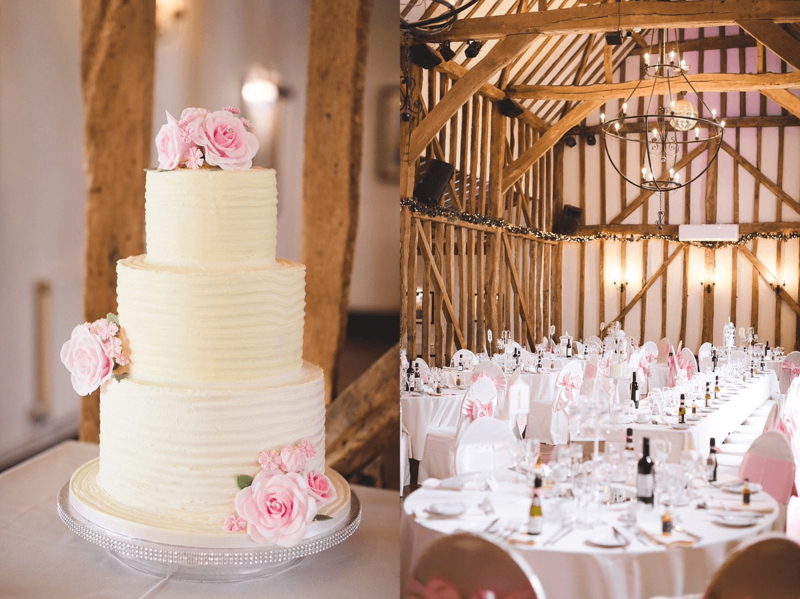 As one of the most popular wedding venues in Essex, we’ve seen our fair share of cakes over the years, and we’re about to break everything down for you. 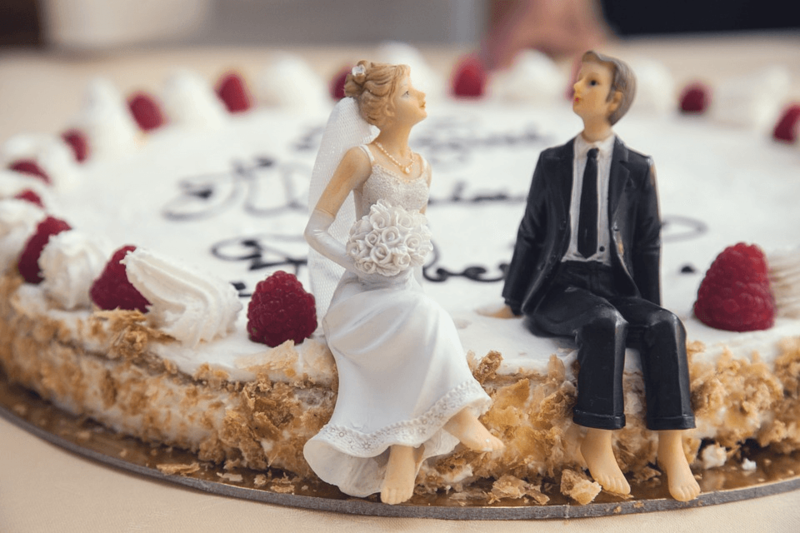 Only a few years ago, most couples stuck to a tried and tested kind of wedding cake, and you rarely saw much originality or flair. Now though, there are no rules! 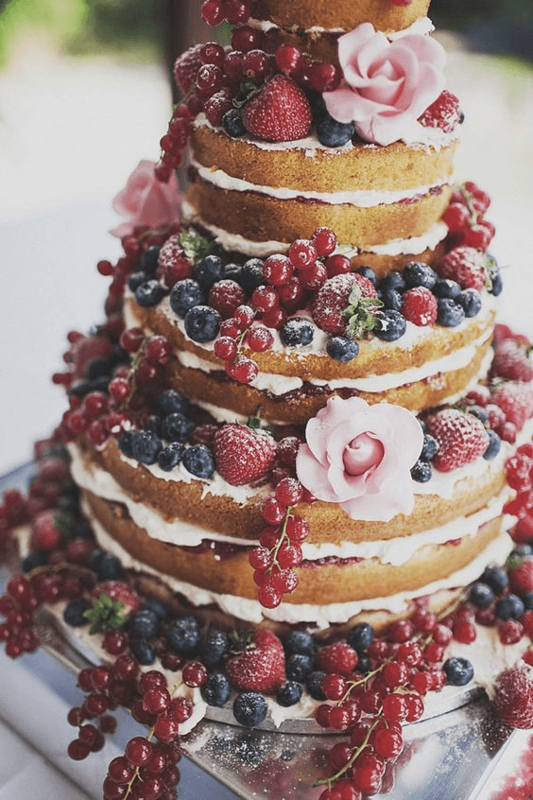 With the explosion in popularity of shows like the Great British Bake Off and a real desire to have a wedding that’s Instagram worthy, we all want unusual wedding cakes that don’t just taste great, but look incredible too. Cakes are bigger and bolder than they’ve ever been, and there’s no right or wrong one to choose for your wedding day. Iced cakes are a traditional favourite, and are what you’re likely to picture if someone asks you to describe a typical wedding cake. It’s been said by some that they’re falling out of favour, but we’ve seen no evidence of that here! Icing allows cake makers to get really creative with their designs, and they can bring all kinds of clients’ ideas to life! With nothing more than some icing to hand, a skilled baker can create something like this stylish monochrome masterpiece, with some incredible 3D bows. If you’re not a fan of icing but don’t want a naked cake, then buttercream could offer you the best of both worlds. Lighter than royal icing but thick enough to cover the layers of your cake, it’s an option that’s becoming increasingly popular for weddings. You do need to be a little more careful about how you store and transport a buttercream cake as it’s more susceptible to picking up imperfections or melting, but that little extra effort is worth it. In fact, a couple who recently held their wedding here at Crondon Park opted for a simple buttercream cake adorned with pretty pink flowers. Stunning, isn’t it? Once you’ve decided how your cake is going to look on the outside, you need to figure out what the inside is going to taste like. It’s really fun to have the inside of your cake be a striking contrast to the icing, providing a surprise pop of colour that will wow your guests. Red velvet cake is the most obvious option here. Paired with white icing, it looks absolutely incredible. Of course, there are lots of other fabulous flavour combinations that you can go for. Some couples like each tier to be a different flavour, so a mixture of fruit, chocolate and Victoria sponge cakes would work really well for that. Carrot cake and lemon cakes are becoming popular now as well, and although they’re slightly more unusual they’re absolutely delicious. Can’t decide between flavours? Then have them all! 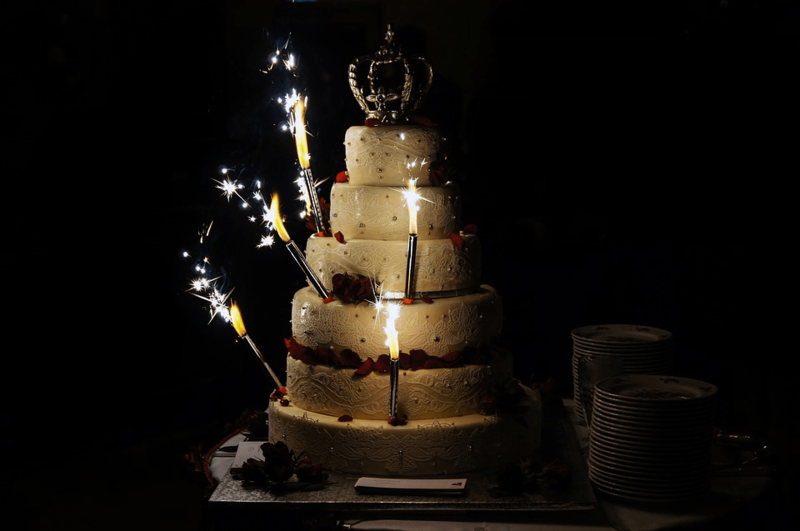 A spectacularly tall cake will look incredible, especially if you’re holding your reception in our grand, specious Baronial Hall. Sometimes though, couples forego a cake completely. It’s a pretty adventurous concept, we know, but rules are made to be broken! 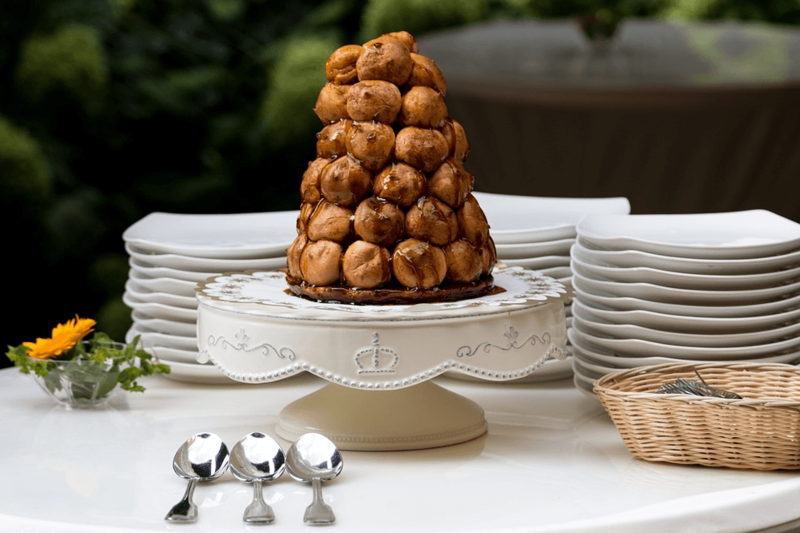 Croquembouche towers, already a favourite at parties, are really in demand right now. That just looks irresistible, doesn’t it? Another option for those who don’t want a wedding cake is an elegant fruit tart. These will work all year round, with light summer fruits like strawberries making for perfect summer eating, while something richer like an apple tarte tatin would be amazing in the winter months. 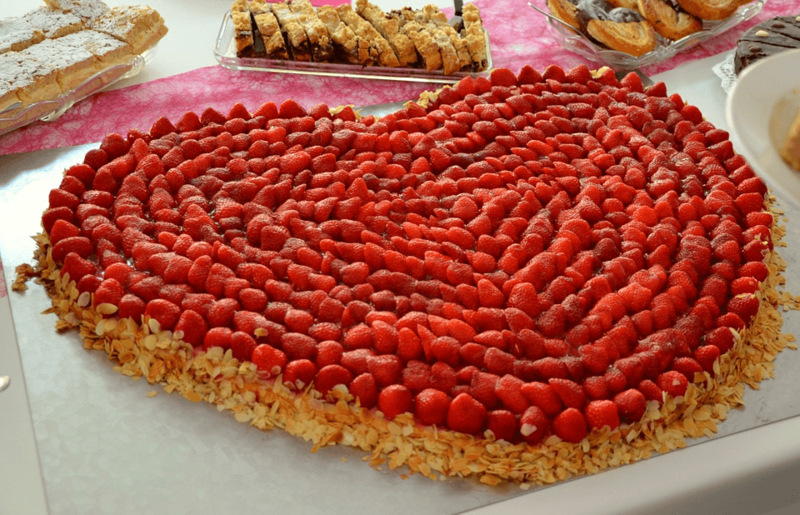 This strawberry tart is a real favourite of ours, and the fact that it’s heart shaped makes it a wonderfully romantic centrepiece that almost looks too good to eat! Cupcake towers are another great idea, and are perfect if you want the great taste of a wedding cake but something that’s easier to serve. Macarons are equally delicious, and in an array of beautiful colours they’ll really look incredible at the centre of the table. So if you really don’t want a cake, there are still plenty of options out there! Toppers and decorations are still popular, and can set off a cake perfectly. Fresh fruit and flowers are ideal for those wanting to create a rustic, informal look. If you want to put on a little bit of a show when it comes to revealing the cake, then sparklers are an original finishing touch. This awe-inspiring cake gives you a great idea of how spectacular they look. Sometimes though, you just can’t beat the classic bride and groom cake topper. You could even have ones made that look like you and your partner. Just take a look at this happily married edible pair. Don’t they just scream wedded bliss? Whatever you and your partner go for, the only thing that matters is that a cake must be perfect for you. So when you’re deciding on a cake, just picture your dream one and go from there. There’s an endless number of flavour, icing and size combinations to think of, so don’t be afraid to really take your time deciding. If that means that you’ve got to try a few different cakes here and there, well, so be it! If you hire an experienced cake maker, they’ll be able to take your ideas and turn them into something that far exceeds your expectations. 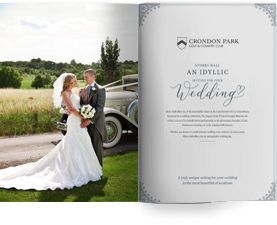 So go on – push the boat out on your wedding day and wow your guests.